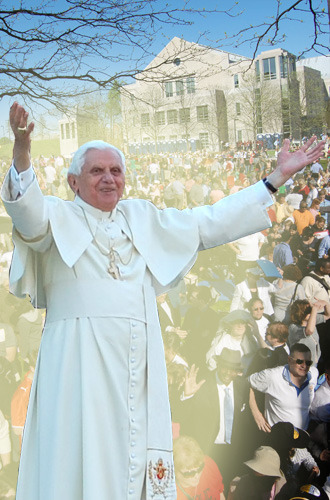 On April 16th, Pope Benedict XVI was greeted by thousands of alumni, students, staff, and visitors gathered on the CUA mall as he arrived at the adjacent Basilica of the National Shrine of the Immaculate Conception. A number of alumni came from as far away as California to glimpse the Pope as he walked up the Shrine’s steps. The following morning, students assembled on the Law School lawn to watch a live broadcast of the Pope’s Mass at Nationals Park on a 23-foot-wide JumboTron screen. By the time the Pope arrived on campus that afternoon to deliver a speech on Catholic education, the law school lawn contained 3,000 students. They cheered as he entered the Pryzbyla Center where he was greeted by approximately 400 Catholic educators. After the Pope’s presentation in the Pryzbyla Center, the crowd of students was able to see the Holy Father in the Popemobile as he departed campus.